Lest the dreamy title throw you, this is not a dreamy film. The title means, quite literally, that in this film there is another Earth dangling above us, quite visibly. But the film is not really sci-fi. It’s a drama. A tad existential, but for those of you who did NOT appreciate Tree of Life, Another Earth is linear and very easy to follow. 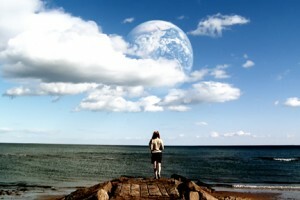 Another Earth is a young film — its writers/director hovering around 30 years old. I have found that this generation of filmmakers tells stories very succinctly. We are out of the gates in the least amount of time possible and have just a ton of information in the first few minutes. Without the exposition being crammed, we know everything we need to know and are propelled very quickly into the action and the heart of the story. A young woman with her whole life ahead of her — just accepted into MIT — is driving and staring up at “Earth 2” when she plows into a mini-van, killing the driver’s little son and pregnant wife. The driver survives. The film then takes on a silent, but not somber tone. After serving time in prison, the young woman adopts a penitential lifestyle which eventually leads her to the man whose family she wiped out. Much of the film has an air of quietude. There is very little talking except for radio, TV and other devices keeping us abreast of the news after the appearance of “Earth 2.” However, there is plenty of story development, all told visually—as it should be! In fact, the audio of the film becomes so non-existent at certain points that I could hear people munching their popcorn in my theater. The young adults in my theater (there were only young adults) squirmed a little at first, cleared throats, but then bought fully into the experience of silence and actually imitated it. Nobody stirred during the quietest on-screen moments. After a while, Another Earth becomes mesmerizing. Even when the young woman begins to talk again, the economical style tale-telling, consistent pace and precise camera angles (with a generous amount of handheld) have locked us in. The story is strong and suspenseful. When the judiciously-utilized music isn’t percussive, it’s a lone piano or violin (the soundtrack is by musicmakers “Fall on Your Sword” — how tragically romantic is that?) There is a noticeable lack of music-video-like sequences or even contemporary rock or hip-hop. The color palette is blue and brown, the visual style is simple but not minimalistic. The acting is naked, exposed and very good, shot in a kind of neo-realism. There are really only two main characters, but it doesn’t feel sparse. The main question posed seems to be (since everyone has a double on “Earth 2”): “What would you do if you could meet yourself? What would you say? What would you see?” I’m not sure this is a worthy, serious question to form a whole movie around, but I can’t stop thinking about it. –THEOLOGY OF THE BODY: This is a great male/female collaboration. Of which much more is needed in Hollywood. Kudos to Brit Marling and Mike Cahill. –This film only cost $500,000 to make! It can be done, people! –I have, like, NO interest whatsoever in space travel. –I always ask myself about a film: What’s the takeaway? What’s MY takeaway? What (if anything) will I remember about this film a year from now, six months from now, 3 weeks from now? I think I’ll remember the stellar acting (especially the cosmonaut joke scene), and just how this young woman handled an “unforgivable” tragedy that she was responsible for. –If this IS sci-fi, it’s Ray Bradbury-style: a little outlandishness for the sake of reflecting on some profound moral truth. However, Mike Cahill, the filmmaker, is actually very, very excited about planets. AND the ending actually doesn’t make sense WITHOUT the parallel Earth, so maybe it’s more sci-fi than it seems at first. –Not fond of the movie poster. Doesn’t say anything. Made me not want to see the film. –This style of indie film reminds me of how 90’s grunge music wanted to dress down the over-the-top 80’s hair bands. Nirvana thought even their drum kits were ridiculous and just pared everything down to “melody.” I think this has been achieved in the realm of film by Another Earth. –You realize just how well-made the film was AFTER you leave the theater. Very well-thought out and executed story. Brilliant exposition. There’s a studied ordinariness to everything in the film that rings true and makes you comfortable at the same time. –Seriously? It made me think of the many times I could have killed somebody because of my carelessness in a car! –VERY little technology-use by characters in the film. The young woman is also a reader. I wonder if there is a contingent of the younger generation that yearns for less technology use in daily life. Or perhaps just a simpler life. –I think there is an obvious redemption theme here AND a less obvious one. Previous ArticleHate Twitter and Facebook? Get Over It.